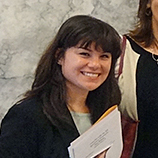 Meet one of United Way’s own, Chloe Williams, and read her experiences around lobby day. Open up United Way of King County’s homepage and you’ll see its mission statement clearly displayed. The mission reads that United Way brings “caring people together to give, volunteer, and take action.” One can guess that “giving” means monetarily while “volunteering” is a nonprofit no-brainer. But what exactly does “take action” entail? Recently, United Way gave me the opportunity to find out. Last week, United Way’s all over the Pacific Northwest congregated in Olympia to discuss with Washington State Representatives and Senators the importance of supporting bills and investing in human services. My experience in advocacy is limited – aside from drafting papers on why the arts are vital and attending “Moral Monday” protests with my dad, I hadn’t participated in anything significant. Partaking in Lobby Day, however, changed that for me. I am no politician, I never took a political science class, and I’ve only seen a few episodes of The West Wing. But the energy of Olympia and meeting with passionate legislators is enough to get anyone to consider a political career. Thanks to Lobby Day, I was able to meet Representative Brady Walkinshaw, who happens to represent my district. Senator Pramila Jayapal also briefly met during a break in a committee meeting. The enthusiasm these leaders exuded is contagious. I can’t describe how encouraging it is to have leaders like Rep. Walkinshaw and Sen. Jayapal offer complete support of the work United Way exhibits. United Way really had brought good,caring people together to take action toward many good causes. The best part was being able to report to the community about the remarkable work that was achieved in Olympia. Because of my experience with Lobby Day, I was able to spread the enthusiasm and get other volunteer support toward Breakfast After the Bell, the Homeless Youth Act, and Home Visiting Services among other issues covered earlier that day. United Way’s Lobby Day is truly an example of how UWKC brings caring people together to take action on behalf of those in need. Thanks so much to our members of Congress for all they do to make Washington a better place for all, and thank you to United Way for giving me this wonderful opportunity to get involved! You can take action to – for more information, check out the public policy work United Way does.